In partnership with the Minnesota Wild, Associated Bank recently hosted an exclusive event for area business leaders at the Minnesota Wild headquarters in St. Paul, Minn. on Feb. 26. The event featured a panel discussion giving guests the opportunity to make connections and discuss key issues. 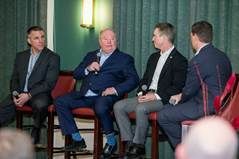 Emceed by Wild announcer Rusty Kath, the panel discussion entertained guests while also providing strategic business insights from Minnesota Wild President Matt Majka, coach Bruce Boudreau and former player Wes Walz. The panel delivered compelling business success stories about the importance of the customer and fan experience to organizations. The conversation also included how the Minnesota Wild has overcome challenges in the marketplace to create a loyal fan base and provided insights on how to stand out in a world of choice. Following the panel discussion, guests were invited to the nearby Herbie’s on the Park restaurant where they could continue the conversation with panel members and network with other guests while enjoying food and beverages.